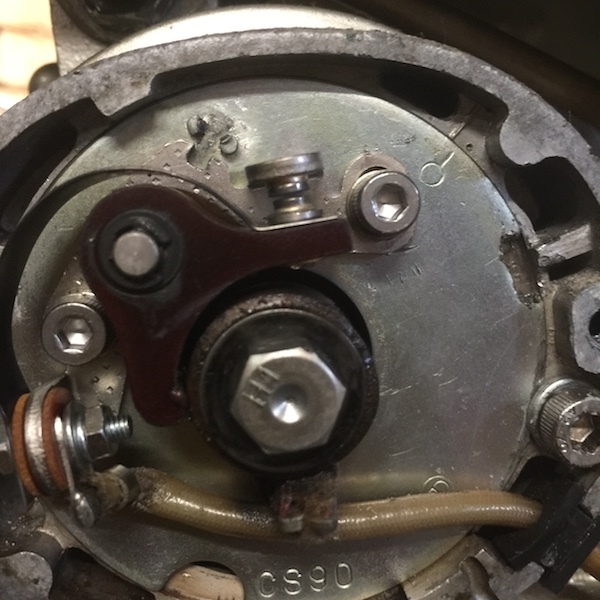 Hello everyone, i don't know how to link posts together but i am curious about my CB100 timing, its past the original timing mark by a cm and its the only way the bike will run, i have tried to put it on the original mark and the bike will not start. i have attached a photo, is this normal or should i be concerned about something else? Im not sure exactly but seems chain may have skipped a tooth. Check it using a stroboscopic timing light. Maybe try leak down test. Just opened mine up for the pic. Heres where it sits. i don't have a strobe light but i will do it the way the manual tells me too. i can have it on the factory line and after a few kicks and pops through the carb it will start but won't rev but if i advance it forward that cm it works perfect. Ill double check that i set the gap right. thank you for sending through your picture, I needed to know how out of whack the bike was. Earlier workshop manuals will only give you "Static timing" procedure. The only thing thats good for is to get the engine running temporarily (not riding), after doing maintenance. Once you get it started and running on static time, you will then have to dial in timing w a stroboscopic timing light. To make her ridable. Sounds like advancer may be stuck as well as cam timing out? Could also be wrong advance mechanism fitted? You did set points gap at correct position? (max opening and not at timing marks)Used to be kinda common that someone would attempt timing, give up and leave cover off allowing weather to get at it. I reset the gap and did the timing using the marks on the fly wheel and used a continuity tester. I have attached an image and this is the closet i can get it to the factory line. it does start first kick and idles really well and it starts on a hill really easy and doesn't sound like it wants to die. when pulling the throttle it really wants to go and i haven't noticed and pinging noises. should i be worried about something or is this due to it being an old bike? i checked if it was running too hot but spark plug is black so i might have to play around with the carb a little bit. Probably wrong here, but aren't the marks on the flywheel for the fully advanced position, that is, with the advancer fully rotated? Or do they show both positions, advanced and retarded? the manual said that i needed to put the flywheel on the F mark and then spin the contact points plate until the buzzer goes out on the continuity tester and thats when the spark occurs, thats where it ended up and the bike runs great. im just hoping im not destroying anything in the engine. I'm not sure if the fly wheel shows the retarded and advanced positions.